"Just their presence, with their heavy equipment, is harmful in and of itself," the minister said that helicopters landing and taking off were a particular problem. "We don't know how much damage the military presence has done because our experts are not permitted to enter the site. "But we have received information that damage has been done to several archaeological sites," he said, mentioning the temples of Nenma and Naboo, and the famed palace of Nebuchadnezzar. Babylon is famous for the hanging gardens built by Nebuchadnezzar, one of the seven wonders of the ancient world, and large parts of it were reconstructed by Saddam Hussein in an attempt to associate himself with his country's former glories. Describing anecdotal accounts of the damage, Mr Jazaeri said ancient roofs and walls had collapsed and buildings had decayed. He also said that workers employed by United States contracting firm Kellogg, Brown & Root (KBR), a subsidiary of Halliburton, had been digging and building in the area around Babylon, causing further damage. Mr Jazaeri said he did not know what the digging was for. Polish commanders and KBR representatives were not immediately available for comment. 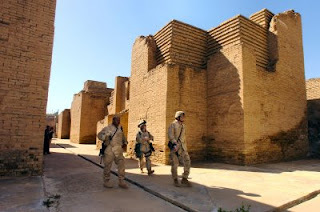 Iraqi officials raised the issue of the Babylon damage in June with the former US governor in Iraq, [war criminal], Paul Bremer, and the former coalition commander, [war criminal], Lieutenant General Ricardo Sanchez, who issued a statement saying they were aware of the complaints. "We already asked Bremer in June to request that an immediate end be put to these activities, but nothing happened," Mr Jazaeri said. "We again ask multinational forces to put an immediate end to such activities. "We can't ignore any more what's going on at the site and the harm that has been done."